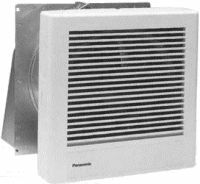 Panasonic's WhisperWall through-the-wall ventilation fan is designed for easy installation and quiet operation (1.1 sone). It only uses 18 watts of electricity, moving 3.9 cfm (cubic feet per minute) per watt. It is suitable for both residential and commercial applications. Adjustable duct and fan cut-out templates are provided to facilitate quick and easy installation. It has a long life condenser motor rated for 30,000 hours of continuous use and thermal fuse protection. The 8 inch diameter duct sleeve (included)can be adjusted to accommodate walls up to 10 inches thick. An outside vent hood with a built-in bird screen and foam seal back draft damper is included. This fan is UL approved for use in a tub or shower enclosure and meet Washington State's stringent VIAQ code. The grill size is 10 1/8 inches square. The exterior hood will protrude 6 inches from the wall. The grill is white.